The RACT badge is a seven pointed Federation Star incorporating the Royal Cypher which was common to both the RAE and RAASC badges. 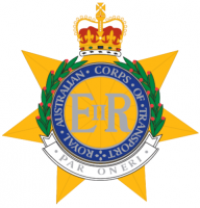 Encircling the Royal Cypher is a circlet containing the name, Royal Australian Corps of Transport. This is enclosed by a laurel wreath and the Corps motto 'Par Oneri'. Click here to download a 2MB png version of the badge.